Today I want to share a little secret with you... you see, I have a bad habit, and I hope I'm not alone in this (if I am, you have my permission to skip this post but I have a feeling you might be just as guilty too). 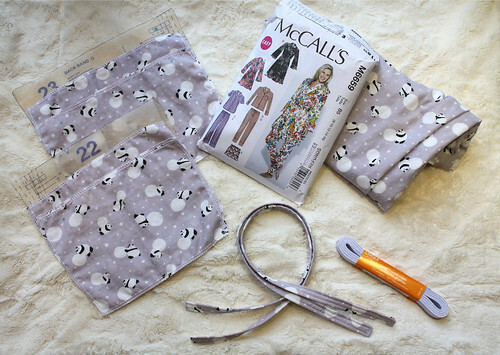 Earlier this month for my August: A Lovely Year of Finishes post, I mentioned a project that followed that description to a T. I bought the most lovely and adorable double gauze by Cosmo textile, complete with sunglass-wearing pandas pushing snow balls. 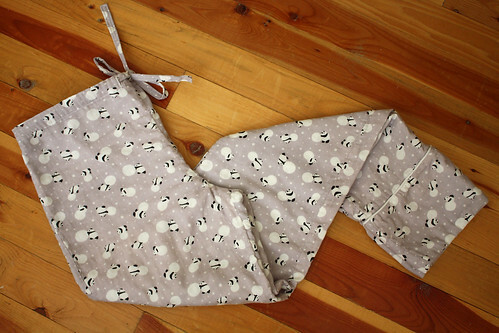 I mean come on, this fabric was just begging to become PJ pants. I have never worked with piping before so when I hit that little snag in my project I gave up. Well temporarily at least. Ever begrudgingly thankful for public goal setting and self-imposed deadlines, I hauled this project out to the cabin with me this weekend to polish 'er off so to speak. My piping is far from perfect, but I think next time it will be better. Part of the problem I had with the piping was that this pattern just wasn't meant for double gauze. While it's luxuriously soft, the bottom ankle panel, which includes an internal facing, is pretty dang thick (we're talking 4 layers!). Four layers, piping and a newbie piper just don't quite work wonderfully. On the plus side though my ankles will be nice and snugly warm this winter. Have you struggled with a similar project in the past? Please tell me I'm not alone! I'm linking up to the August: A Lovely Year of Finishes - Finishing Party over at Fiber of all Sorts. Seriously this is amazing. I have been trying to finish some for years now. I will try this pattern! They look great! I'm sure I've had projects like that in the past, though I can't think of one off the top of my head. 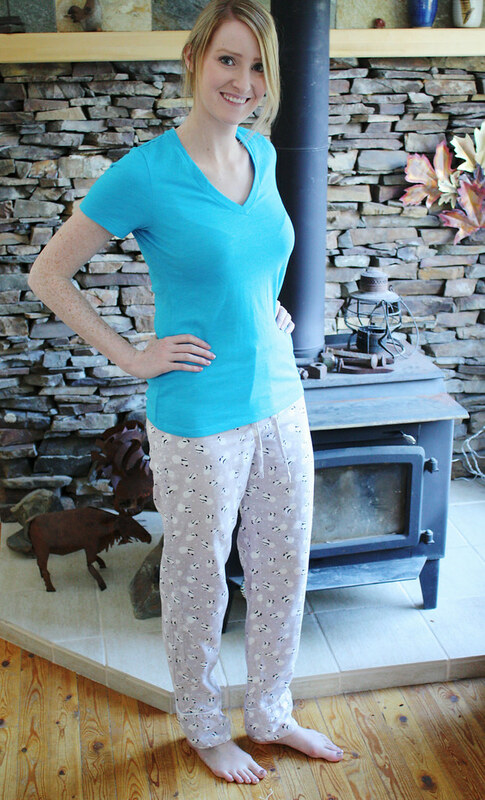 Probably any time I've tried garments?! Nice looking cabin too!! And i can assure you i'm queen at the supermarket sweep! The number of projects i have that just get swept aside makes me wonder why anyone still reads my blog, i rarely finish anything!! High five for another fantastic finish! 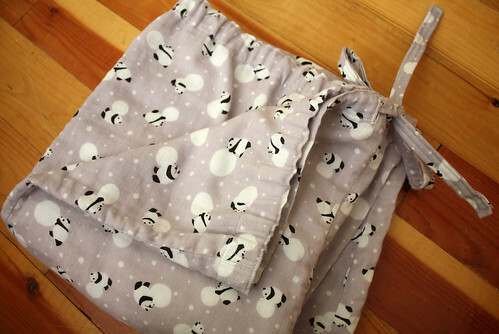 Beautiful PJ pants! So cute. :-). I've had projects like that before... Mostly garments. 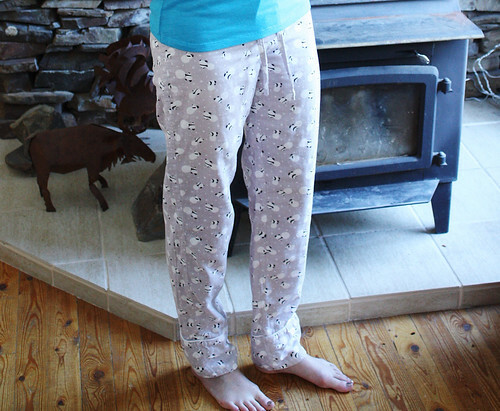 I get buy all the supplies, start sewing, try the garment on and when it doesn't fit properly (which happens often! ), I throw the whole project in a drawer and forget about it.